If you haven't yet been to the Society for Financial Econometrics (SoFiE) annual meeting, now's the time. They're pulling out all the stops for the 10th anniversary at NYU Stern, June 21-23, 2017. There will be a good mix of financial econometrics and empirical finance (invited speakers here; full program here). 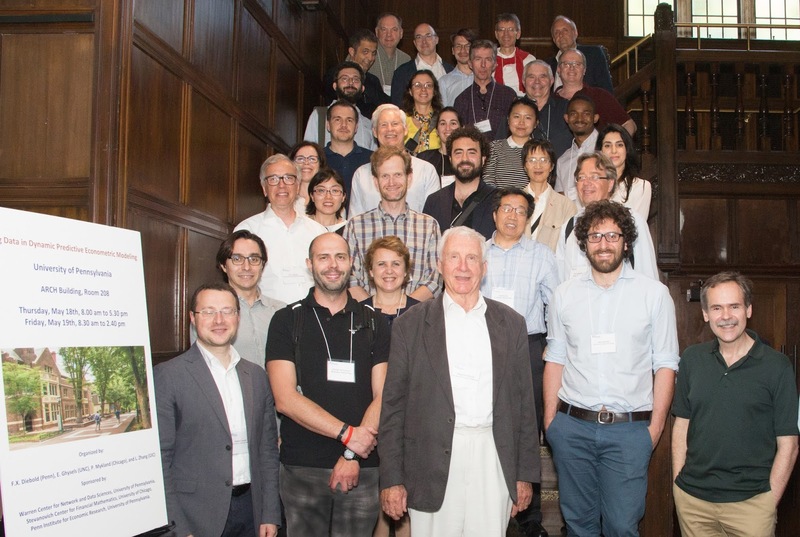 The "pre-conference" will also continue, this year June 20, with presentations by junior scholars (new/recent Ph.D.'s) and discussions by senior scholars. Lots of information here. See you there! Here's a speakers' photo from last week's Penn conference, Big Data in Dynamic Predictive Econometric Modeling. Click through to find the program, copies of papers and slides, a participant list, and a few more photos. A good and productive time was had by all! Efron and Tibshirani's Computer Age Statistical Inference (CASI) is about as good as it gets. Just read it. (Yes, I generally gush about most work in the Efron, Hastie, Tibshirani, Brieman, Friedman, et al. tradition. But there's good reason for that.) As with the earlier Hastie-Tibshirani Springer-published blockbusters (e.g., here), the CASI publisher (Cambridge) has allowed ungated posting of the pdf (here). Hats off to Efron, Tibshirani, Springer, and Cambridge. I blogged a few weeks ago on "the file drawer problem". In that vein, check out the interesting new paper below. I like their term "p-hacking". Note that reverse p-hacking can also occur, when an author wants low p-values. In the study below, for example, the deck could be stacked with all sorts of dubious/spurious "anomaly variables" that no one ever took seriously. Then of course a very large number would wind up with low p-values. I am not suggesting that the study below is guilty of this; rather, I simply had never thought about reverse p-hacking before, and this paper led me to think of the possibility, so I'm relaying the thought. It would be interesting to compare anomalies published in "top journals" and "non-top journals" to see whether the top journals are more guilty or less guilty of p-hacking. I can think of competing factors that could tip it either way! The anomalies literature is infested with widespread p-hacking. We replicate the entire anomalies literature in finance and accounting by compiling a largest-to-date data library that contains 447 anomaly variables. With microcaps alleviated via New York Stock Exchange breakpoints and value-weighted returns, 286 anomalies (64%) including 95 out of 102 liquidity variables (93%) are insignificant at the conventional 5% level. Imposing the cutoff t-value of three raises the number of insignificance to 380 (85%). Even for the 161 significant anomalies, their magnitudes are often much lower than originally reported. Out of the 161, the q-factor model leaves 115 alphas insignificant (150 with t < 3). In all, capital markets are more efficient than previously recognized. The slides from my "overview" IMF talk two weeks ago proved popular, so here are some different overview slides on a different topic ("Estimating and Understanding High-Dimensional Dynamic Stochastic Econometric Models"), from my talk at last week's NYU Stern Conference on Volatility and Derivatives.